Get a sneak peak at Rogue One: A Star Wars Story with the official theatrical poster. Crank up your John Williams' soundtrack, there's some new Star Wars news! With the release of Rogue One: A Star Wars Story just over two months away, the buildup continues with the unveiling of the film's official theatrical poster. And with a new trailer about to be dropped online, Disney are truly ramping up the excitement ahead of the movie's launch on December 16. If you're trying to avoid spoilers at all costs, you might not want to scroll any further, but for everyone else, here's what you'll see plastered over cinemas for the next couple of months. 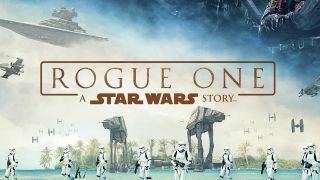 Following a band of rebel freedom fighters as they struggle to steal the plans to the Death Star, Rogue One: A Star Wars story is set before the original 1977 film. Plenty of imagery from the classic trilogy appears in this poster, including AT-AT walkers and vintage stormtroopers, as well as Darth Vader himself. However it's good to see the cast of new characters are rightfully taking the centre stage. Are we reading too much into some of the positioning of Darth Vader next to Jyn, the film's female lead character? Or is this a subtle suggestion of what happens to her? There's not long left to speculate, but in the mean time fans can look forward to a new trailer that will go live today.